If you have ever watched any home renovation programmes on TV you will know that the tiny house is very trendy at the moment. Commonly referred to by Kiwis as granny flats or sleep-outs, and classified by NZ Councils as minor dwellings or family flats, small houses separate from the main dwelling are a cost-effective way to gain extra space. 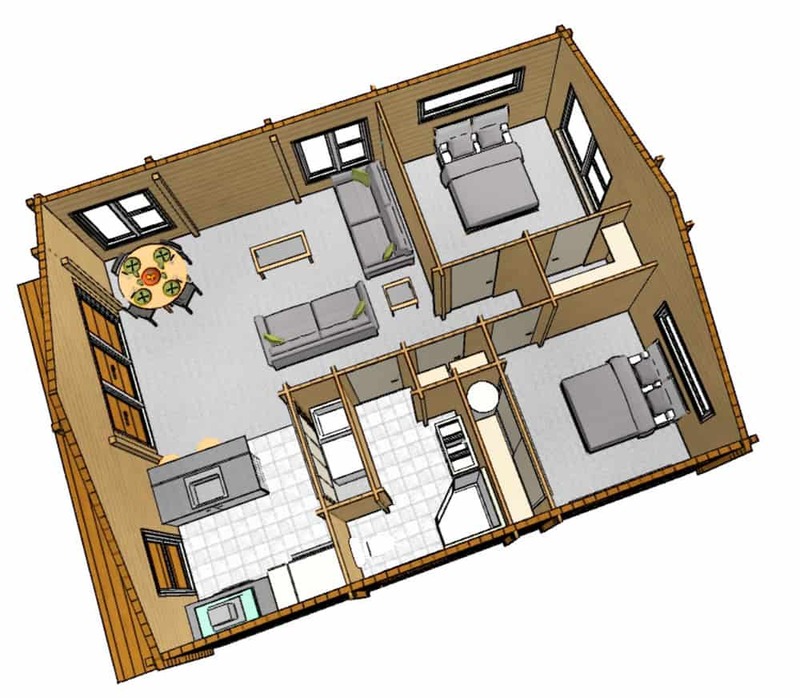 Fraemohs’ new tiny house design, currently known as the “Kiwi”, is ideal for accommodating older relatives, or as a home office or teenage retreat. It would also make an excellent and easy-to-build holiday home. The Kiwi’s clever design includes 2 bedrooms, a modern kitchen and open plan living area and a separate, easily-accessed laundry. The “Kiwi” is the newer, bigger sibling of Fraemohs’ earlier tiny house – the Little Owl. The Kiwi’s floor area of just under 65m2 complies with the district plan requirements of many local Councils for family flats, including those in the greater Christchurch area. As requirements vary around NZ, your local Council will be able to advise you of the process if you are keen to add a Kiwi to your property. The friendly team at Fraemohs will also be happy to do the research for you and can easily modify the Kiwi to bring its floor area under the 60m2 specified by some local authorities. Despite its compact size the Kiwi still has plenty of storage space, including a walk-in wardrobe off the main bedroom and a linen cupboard. As well as achieving such efficient use of space, Fraemohs has allowed for flexibility with the design, such as provision for a separate toilet if preferred. There is also the option of adding a deck or patio so that you can make the most of the opportunities for indoor-outdoor living during the New Zealand summer. As with all Fraemohs’ homes, the Kiwi’s timber construction makes it attractive and cost-effective. The only problem with the design is its name – we all love Kiwis of course but to be fair the name is a bit over-used. That’s why Fraemohs are running a competition to come up with a new and more appropriate name to match this smart tiny house design. So keep an eye out for the competition details, get thinking of a name and you could win some great prizes!